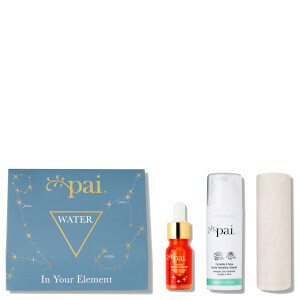 Harness the power of the elements to discover skin confidence with the Pai In Your Element Collection: Air; a duo of carefully curated skincare must-haves for any Gemini, Aquarius or Libra. Pairing the brand’s cult-favourite Andean Rosehip-powered multi-tasking oil with a soothing botanical-infused day cream, the decadent collection for air signs promises to revive skin’s health, resilience and radiance. Presented in a sleek gift box. ​Immerse yourself in the warm, earthy aromas of Pai’s best-selling, luxurious oil; a potent serum that will noticeably improve your skin's appearance. Using a potent blend of Rosehip oils, which is rich in trans-retinoic acids and Omegas, this multi-use product will encourage the natural healing process of the epidermis. You'll see a renewed elasticity and a reduction in the appearance of stretch marks, scars and fine lines. A soothing moisturiser developed to calm redness and irritation, leaving skin comfortable all day long. Fortified with skin-repairing ingredients, including Rosehip, antioxidants and omegas, the lightweight cream absorbs quickly into skin to restore a hydrated, healthy-looking complexion. Oil: Apply 2-3 drops to the palm of your hand and use fingertips to gently massage into clean, slightly damp skin on face or body. Allow the oil to fully absorb before dressing. For best results, we recommend using oils at night before bed and creams in the morning. Cream: Massage 1-2 pumps into clean, dry skin on face and neck. Use daily in the mornings or whenever your skin needs a moisture top-up. Oil: Rosa Canina Seed Extract*, Rosa Canina Fruit Extract*, Tocopherol, Rosmarinus Officinalis Leaf Extract*. *Organically produced 99% of product. Cream: Aqua - Purified Water, Prunus Armeniaca Kernel Oil* - Apricot Kernel Oil, Simmondsia Chinensis Seed Oil* - Jojoba Oil, Carthamus Tinctorius Seed Oil* - Thistle Oil, Cetearyl Alcohol - Naturally derived Emulsifier from sustainable Palm Oil, Glycerin - Organic derived Vegetable Glycerine, Rosa Canina Seed Extract* - Rosehip Seed Extract, Butyrospermum Parkii Butter* - Shea Butter, Cetearyl Glucoside - Naturally derived Emulsifier from Wheat Seed (Gluten Free), Chamomilla Recutita (Matricaria) Flower Extract* - Chamomile Extract, Leptospermum Scoparium Branch/Leaf Oil - Manuka Oil, Sodium Levulinate -Natural Preservative derived from Maize, Tocopherol - Natural Vitamin E, Lavandula Angustifolia Oil* - Lavender Oil, Sodium Anisate -Natural Preservative derived from Basil, Pelargonium Graveolens Oil* - Rose Geranium Oil, Lactic Acid - pH regulator derived from Maize, Glyceryl Stearate Citrate - Naturally derived Emulsifier from sustainable Palm Oil, Sodium Lauroyl Lactylate - Naturally Preservative derived from Coconut Oil, Rosmarinus Officinalis Leaf Extract* - Rosemary Extract.